I figured the chairs in our courtyard were beginning to catch on when I overheard an exchange between one of our neighbors, sitting in the blue chair, and Mateo, our two-and-a-half-year-old grandson. “I no share that chair!” Mateo shouted from the second-floor window. And it’s nice to see that our neighbors like not only the blue chair but the red one and the two green ones. This all started, about a year ago, with the bench. One of our neighbors put it on the sidewalk, a neighborhood signal that it was available for the taking. On her way out the next morning, Kate spotted the bench and took it, dragging it onto the grass with the idea of hauling it up to her second-floor apartment after she got home. But when she returned, the bench was occupied. The bench, it seemed, had a different future in mind. Apartment living can be quite social and/or quite solitary. U-shaped, courtyard buildings like ours offer a footprint for human interaction. The courtyard is a common ground, a front yard for all of us. But it helps to have somewhere to sit besides cement stoops. 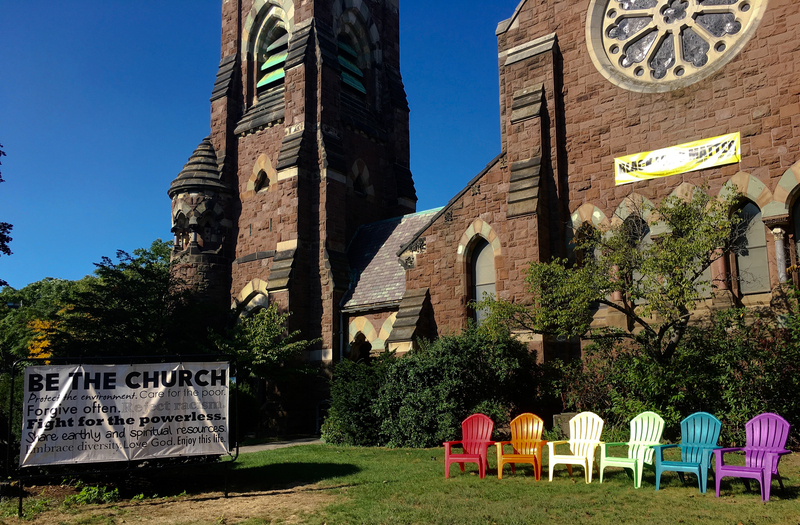 After a few months with the bench, we noticed that United Parish across Harvard Street from us had set out a rainbow array of six plastic Adirondack chairs on its front lawn. Every now and then, passersby stopped and took a seat. Carol noticed the same chairs on sale out in front of the local hardware store and gave me an assignment: go buy some chairs! So now, along with the bench that’s still there and a pile of construction equipment for the endless tuckpointing and masonry repair of our building, we have four faux Adirondacks. The nice thing about plastic chairs is how easy they are to move. And there’s something about positioning “your very own seat,” as city planner Amanda Burden puts it, that can make people feel at home in a public space. I suppose an apartment building’s courtyard is a semi-public space. I get irritated when non-residents walk their dogs into the courtyard as a handy toilet, but I’d welcome their visits to sit for a while. 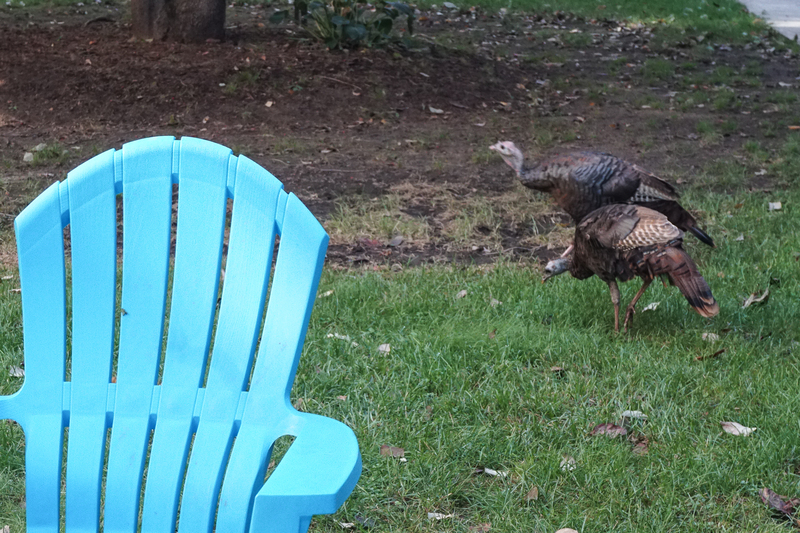 Especially since the wild turkeys roaming the neighborhood seem to feel so at home perched on the bench. 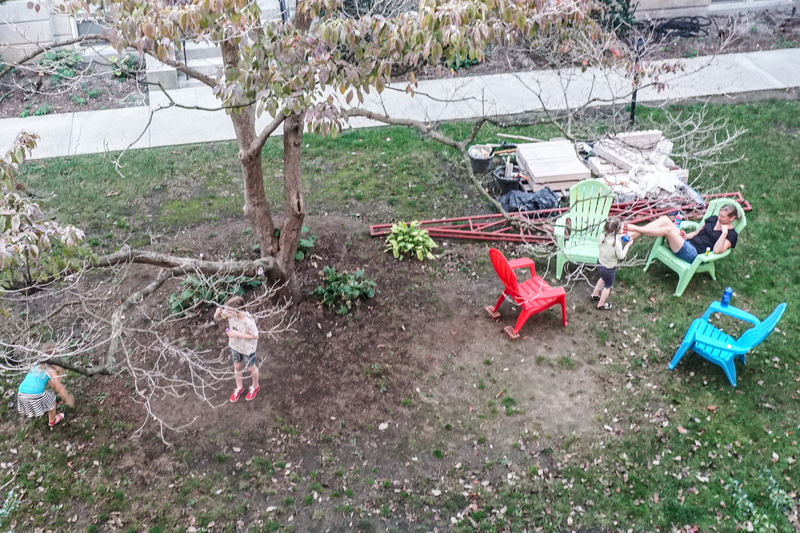 Mostly, though, we’re hoping more and more of our courtyard neighbors will make use of the chairs before the New England weather interrupts such pleasures for several months. For us, having places to sit in the courtyard has given us another place to spend time along with an update in what we’ve learned over the years about living space — inside and out, private and public, secured and shared. The two-bedroom apartment we’ve occupied for the past two years already represents a significant step up in space after two years of life in a room. Living at the Friends House taught us that, even though our private space was limited to the room we slept in, a spacious library, sunny deck and other shared areas addressed our needs quite nicely. Twenty-five years ago, we moved from the most depressed housing market in the nation to the most inflated. We found that buying half the house for twice the money worked out OK in Silicon Valley because we spent so much of our time out back around a nice deck and pool. We followed that up with a Florida house that also opened nicely to the outside. But our outside spaces in California and Florida were both out back, which provided isolation along with privacy. The courtyard is out front, which sacrifices privacy but helps us get to know our neighbors. Once that’s settled, we can all take a seat. Just not in the blue chair. How have your living spaces shaped the way you live? Please chime in in the comments section below or in with a comment attached to our Facebook post here. 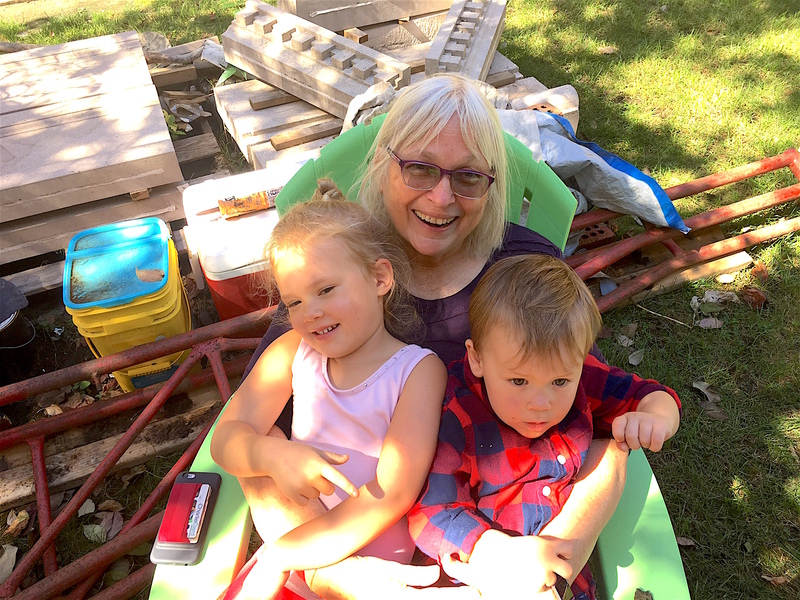 This entry was posted in Grandchildren, Living spaces, Neighbors and tagged By Bill Mitchell. Bookmark the permalink. Bill & CAROL thanks for a great article!